The avatars and masters have now permeated the grid-work of the world, bringing with them their own tools for teaching. This structure of the Language of Light is a way of receiving information and energy to facilitate your development. It is a method of learning without doing it through books or through the intellect. It involves opening to the belief that there is indeed a hierarchy, immense beyond your comprehension, that has been working with humanity since the very beginning. 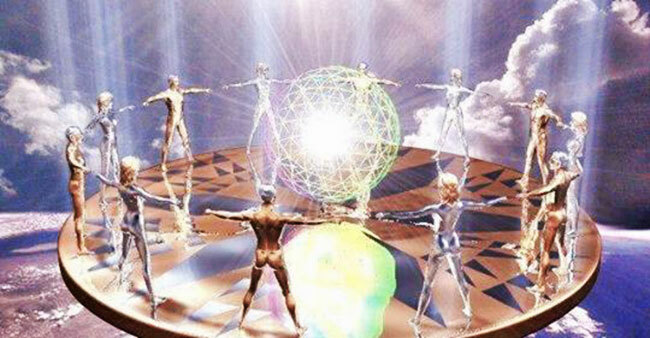 There are 144,000 members of the spiritual hierarchy who are infused in the grid-work of the planet at this time. Each master has its own seal that represents one portion of the Language of Light, and you have 144,000 seals of energy that will eventually be infused within your being. Taking the spiral within is one part of the journey. The trick is to both go within and go without - and to realize that they are the same. The spiral is the key to tapping into what is inside of you. Your DNA is in the form of a spiral. Spirals are all around you, and the Language of Light rides upon the light-encoded filaments that also descend in spiral form. This is something that is experiential, and it will grow for you. These Language of Light geometrical shapes and forms are collections of experiences of individuals who have incarnated on this planet, defied the human laws, awakened themselves to high abilities and then manifested themselves as language and geometric components. Once these energies existed as men and women on this planet. They have evolved themselves into geometric symbols, and they exist in their sphere of activity just like you exist in your body. These entities exist in a language system or a geometric system. There are universes of these systems, and there are visitations into your own universe from those universes at this time. There are circles and other shapes being put upon this planet in the grain fields that are inexplicable as far as you are concerned. These imprints are a frequency, not a process or action. There is a song or story or language that is being implanted on the surface of Earth with language symbols. These symbols come to establish a certain frequency, and they are going to increase. In third-dimensional reality, many portals are now being opened to bring about evolution upon Earth. At one time, the planet was sealed off and put in quarantine because there were forces that fought here. There have been incredible wars upon this planet, and some of the vestiges of these wars still exist as very barren areas upon the planet. This was the time of chaos and confusion when creator gods fought creator gods. During the most recent wave of the wars, about ten or twelve thousand years ago, Earth was sealed off because those beings who operated with light lost the battle. Light does not always win, you know. Light is not always the victor as you think of a victor, for light must learn to integrate with all portions of itself. Prime Creator is within all things, and light and dark are part of the Creator. Therefore, light must incorporate with the dark portion of itself. In order for energy to work its way through your consciousness, it must house itself on the planet. Intelligence penetrates in the form of waves making geometric shapes on Earth. It is not that a spaceship comes down, makes crop circles in the night, and then takes off. Although some circles have been caused by ship landings, intelligence can take the guise of any form it wants, and very often intelligence comes in the form of a wave. Intelligence is beyond the spoken word and beyond the written word, for it is frequency that sometimes comes in geometric shapes. Pythagoras had a beginning grasp of this, but his geometry was not understood by others. Geometry is an evolved intelligence, a collection of experience that can communicate huge amounts of information. The circles and shapes being put on Earth are here to assist you in holding and managing your frequency and having the courage to live your light. They make frequency information available in a very subtle way, and no one can figure them out yet. These shapes are all connected to one another, and if they were all written out simultaneously on some farmer's field, something would happen to them immediately. They are spaced from one continent to another, and they move a frequency band around the planet that will help activate Earth's grid-work. They will allow you not to feel so weird with what you know and to feel more comfortable with the changes in frequency as they occur. The shapes coming onto Earth are like energy gates or energy glyphs. They hold intelligence and are being set up to eventually connect and make an intelligent grid-work around the planet. This grid-work will have a frequency that humanity can use to evolve. You are all portions of beings who are striving in a most glorious way to become more. As you remember that, and as you remember that there are those who would assist you as your guardian, guides, advisors, as you learn to recognize who you are and what path you are headed on, you can carry this out to the fullest expression of joy. You would be astounded at what would start happening to you. Remember that you are this light being, this light entity and you will carry a steadfastness of power and beauty to wherever you are going and you will not have to feel or be affected by the vibrations of others. When you buy into any version of fear, it can become your experience because your molecules are intelligent and your energy responds to the predominant feeling in your being. The focus of your mind is exactly what gives the orders to create what you experience. You must learn to end the wars in your world by ending them in your minds. There are numbers on your planet who have been highly evolved beings and it was in a state of grace to be in their presence. This is what you are learning. This is what you need to recognize. Do not advertise by word of mouth. Live by aura of being.